Download "Course Outline. 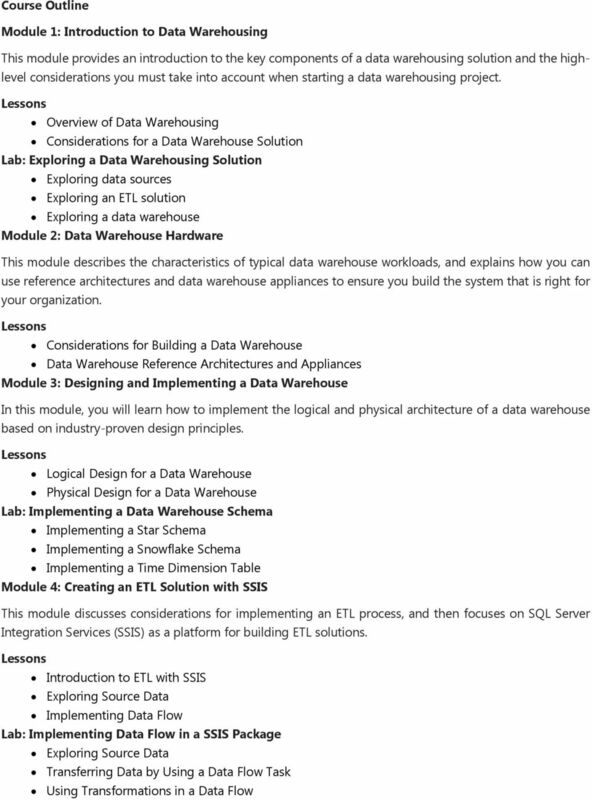 Module 1: Introduction to Data Warehousing"
3 Using a Change Data Capture Using Change Tracking Lab: Loading Incremental Changes Using a Lookup Transformation to Insert Dimension Data Using a Lookup Transformation to Insert or Update Dimension Data Implementing a Slowly Changing Dimension Using a MERGE Statement to Load Fact Data Module 8: Incorporating Data from the Cloud into a Data Warehouse In this module, you will learn about how you can use cloud computing in your data warehouse infrastructure and learn about the tools and services available from the Microsoft Azure Marketplace. Overview of Cloud Data Sources SQL Server Database The Windows Azure Marketplace Lab: Using Cloud Data in a Data Warehouse Solution Creating a SQL Azure Database Extracting Data from a SQL Azure Database Obtaining Data from the Windows Azure Marketplace Module 9: Enforcing Data Quality Ensuring the high quality of data is essential if the results of data analysis are to be trusted. This module explains how to use the SQL Server 2012 Data Quality Services (DQS) to provide a computer assisted process for cleansing data values and identifying and removing duplicate data entities. 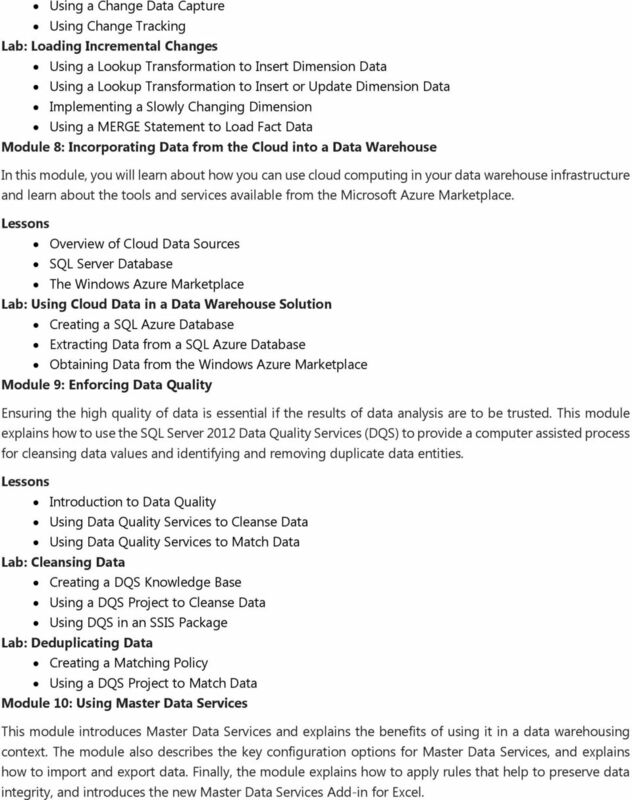 Introduction to Data Quality Using Data Quality Services to Cleanse Data Using Data Quality Services to Match Data Lab: Cleansing Data Creating a DQS Knowledge Base Using a DQS Project to Cleanse Data Using DQS in an SSIS Package Lab: Deduplicating Data Creating a Matching Policy Using a DQS Project to Match Data Module 10: Using Master Data Services This module introduces Master Data Services and explains the benefits of using it in a data warehousing context. The module also describes the key configuration options for Master Data Services, and explains how to import and export data. 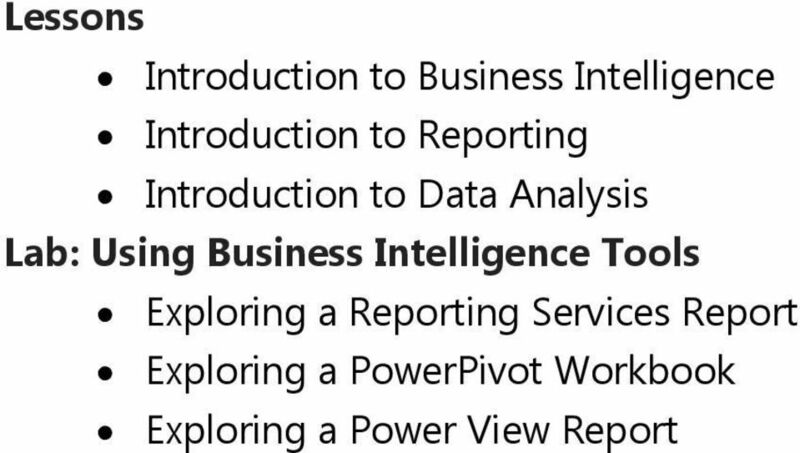 Finally, the module explains how to apply rules that help to preserve data integrity, and introduces the new Master Data Services Add-in for Excel. 4 Introduction to Master Data Services Implementing a Master Data Services Model Using the Master Data Services Add-in for Excel Lab: Implementing Master Data Services Creating a Basic Model Editing a Model by Using the Master Data Services Add-in for Excel Loading Data into a Model Enforcing Business Rules Consuming Master Data Services Data Module 11: Extending SQL Server Integration Services This module describes the techniques you can use to extend SQL Server Integration Services (SSIS). 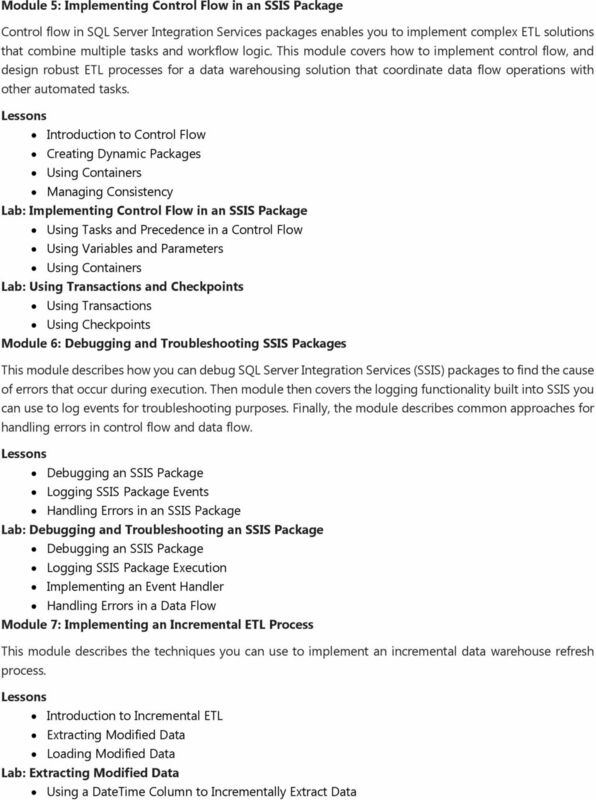 The module is not designed to be a comprehensive guide to developing custom SSIS solutions, but to provide an awareness of the fundamental steps required to use custom components and scripts in an ETL process that is based on SSIS. Using Custom Components in SSIS Using Scripts in SSIS Lab: Using Custom Components and Scripts Using a Custom Component Using a Script Task Module 12: Deploying and Configuring SSIS Packages SQL Server Integration Services provides tools that make it easy to deploy packages to another computer. The deployment tools also manage any dependencies, such as configurations and files that the package needs. In this module, you will learn how to use these tools to install packages and their dependencies on a target computer. 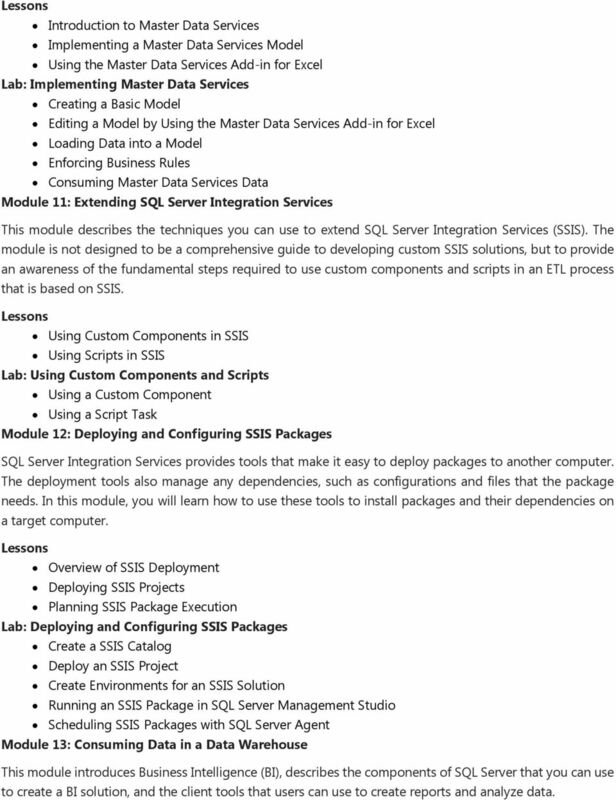 Overview of SSIS Deployment Deploying SSIS Projects Planning SSIS Package Execution Lab: Deploying and Configuring SSIS Packages Create a SSIS Catalog Deploy an SSIS Project Create Environments for an SSIS Solution Running an SSIS Package in SQL Server Management Studio Scheduling SSIS Packages with SQL Server Agent Module 13: Consuming Data in a Data Warehouse This module introduces Business Intelligence (BI), describes the components of SQL Server that you can use to create a BI solution, and the client tools that users can use to create reports and analyze data. Correct Answer: J Explanation. Explanation/Reference: According to these references, this answer looks correct. 70-467: Designing Business Intelligence Solutions with Microsoft SQL Server The following tables show where changes to exam 70-467 have been made to include updates that relate to SQL Server 2014 tasks. www.dumpspdf.com Microsoft 70-463 Implementing a Data Warehouse with Microsoft SQL Server 2012 Version: Demo 20.0 QUESTION NO: 1 Microsoft 70-463 Exam You work as a senior database administrator at TestKing.com.